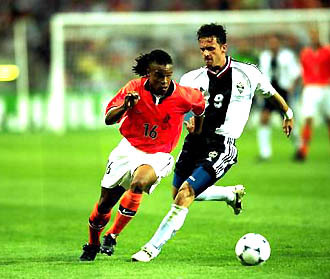 Patrick Kluivert scored four times as Holland thrashed Yugoslavia 6-1 in their Euro 2000 quarter-final in Rotterdam on Sunday. Kluivert struck in the 24th, 38th, 51st and 54th minutes before being substituted shortly afterwards. The Dutch delighted their massed ranks of orange-clad supporters with a sparkling display of open and attacking football to which the shellshocked Yugoslavs had no answer. Kluivert's first two goals were virtually identical as he twice found space to outwit the Yugoslav defence. The Barcelona hitman was picked out by floated balls from first Dennis Bergkamp and then Edgar Davids, both of which he tucked away in style. Kluivert completed his hat-trick with a side-footed finish into the roof of the net from close range after Paul Bosvelt's trickery beat Dragan Stojkovic early in the second half. Astonishingly, Kluivert added his fourth goal with 36 minutes to play. This time Boudewijn Zenden fed him inside the six-yard area and his half-hit finish bobbled just inside Ivica Krajl's far post. Kluivert looked on course to become the first player to win a golden boot within the space of a single match before he was taken off after receiving a knock in an aerial challenge with Sinisa Mihajlovic. By now the Dutch carnival was in full swing and Marc Overmars added his own party-piece in the 78th minute, flicking up Bergkamp's square pass before striking it cleanly into the top left hand corner. Overmars completed the rout in the final minute, stroking home the rebound after Philip Cocu had thumped the foot of the post. Then in the dying seconds Savo Milosevic stroked home a scant consolation for the Yugoslavs after Predrag Mijatovic hit the bar. It was his fifth goal of the tournament. 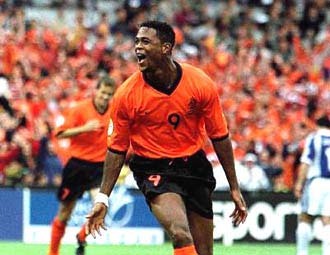 Afterwards Kluivert cast doubt on his historic goal blitz by admitting one of his goals had gone in off a Yugoslav player. No player has ever scored four in a game in the European Championship finals but Kluivert's place in the history books has been shrouded in mystery. He admitted the ball had cannoned into the net off Dejan Govedarica after a right-wing cross from Paul Bosvelt in the 51st minute. That initially had appeared to complete his hat-trick. Kluivert said: "It went in off the defender but the ref said the goal had been given to me." Coach Frank Rijkaard, who said he had taken off his goal hero as a precaution, insisted the 6-1 win was the result of a superb team performance rather than individual brilliance. Rijkaard said: "Patrick did a wonderful job but it was a wonderful team performance. If nobody gives him the ball he can't score but it's exciting to see him play like that."